GLO Teeth Whitening system is a ground-breaking do-it-at-home teeth whitening solution. 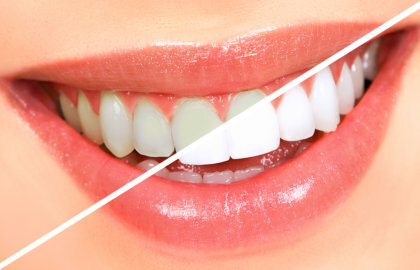 None of the patients at Smile Clinic that used the GLO teeth whitening system experienced painful “zingers” that are commonly associated with other professional teeth whitening procedures. Developed by celebrated oral health expert, Dr. Jonathan Levine, GLO Teeth Whitening offers superior teeth whitening power that promises no sensitivity post-treatment. It is clinically proven to whiten your teeth up to five shades in five days. It uses a technology called Guided Light Optic that funnels the power of heat and a neon blue light in a form-fitted mouth tray. The intensity of the tray’s light and heat prevents active oxygen from escaping the tooth’s surface, which effectively speeds up the whitening results while avoiding tooth sensitivity. The product recently won a silver medal for Consumer Packaged Goods in the 2012 Edison Awards [Edison, 2012], and has been touted by Sephora and TV doctors as the next big thing in teeth whitening.